COLEMAN RAY CLARK (Director/NTT Artistic Director) returns to New Threshold Theatre after directing ... All Greek Mythology In 99 Minutes Or Less, Charade, and Completely Hollywood: Abridged. Selective community credits include It's A Wonderful Life, B:Side Myself (TheatreSquared); A Christmas Carol, All My Sons, Into The Woods (University of Arkansas); The Glass Menagerie, Oklahoma!, The Dumb Waiter (Fayetteville High School); Hairspray, The Outsiders, A Separate Peace (Arts Live Theatre); and producing shows as part of his own youth theatre company, 13: The Musical, (New Threshold Theatre). Coleman is eighteen years old and a senior at Fayetteville High School. ANDREW SINCLAIR (Mysterious Man) makes his New Threshold Theatre debut. With the Cate School Theatre, he recently appeared as The Innkeeper in Don Quixote, and Mr. Darcy in Pride and Prejudice. Regional credits include The BFG/The Twits, and Alice in Wonderland Jr. (Lincoln Junior High); and Annie Jr. (Arts Live Theatre). He is eighteen years old and is a freshman at Hamilton College in New York. ERIN FARRAH (Baker"s Wife) is excited to make her New Threshold Theatre stage debut. 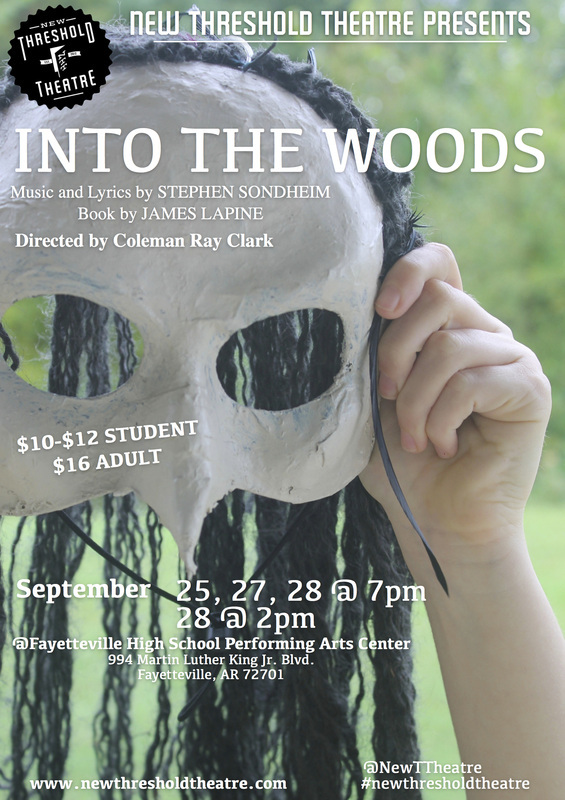 She is part of the cast of New Threshold Theatre's "New Threshold Theatre Live" and has recently appeared as Sandrine in Fayetteville High School's "Almost, Maine". She is seventeen years old and is a senior at Fayetteville High School. GABBY CHRONISTER (Cinderella) returns to New Threshold Theatre as Cinderella. In the Fall of 2013, Gabby played Cassie in New Threshold's production of 13: The Musical; a Dynamite in Hairspray Jr. (Arts Live Theatre). Gabby has appeared as Alice in Alice in Wonderland Jr.; Miss Gloop in Willy Wonka Jr.; Mrs. Potts in Beauty and the Beast Jr.; and Iago in Aladdin Jr. (Stage One Entertainment); Children's Choir in Joseph and the Amazing Technicolor Dreamcoat (Rogers Little Theatre). Gabby is a member of "Breaking Silence the band" and a home-schooled graduate. She would love to thank Jesus Christ and her family and friends for this opportunity! HANNAH VILLINES (Little Red) returns to New Threshold Theatre after playing Lucy in 13: The Musical. Her community theatre credits include Fiddler on the Roof, Alice in Wonderland, Hairspray, Charlotte's Web (Arts Live Theatre), Almost Maine (Fayetteville High School), and Seussical (Trike Theatre). Film credits include Five Keys to Meeting Women (5 Keys Productions). 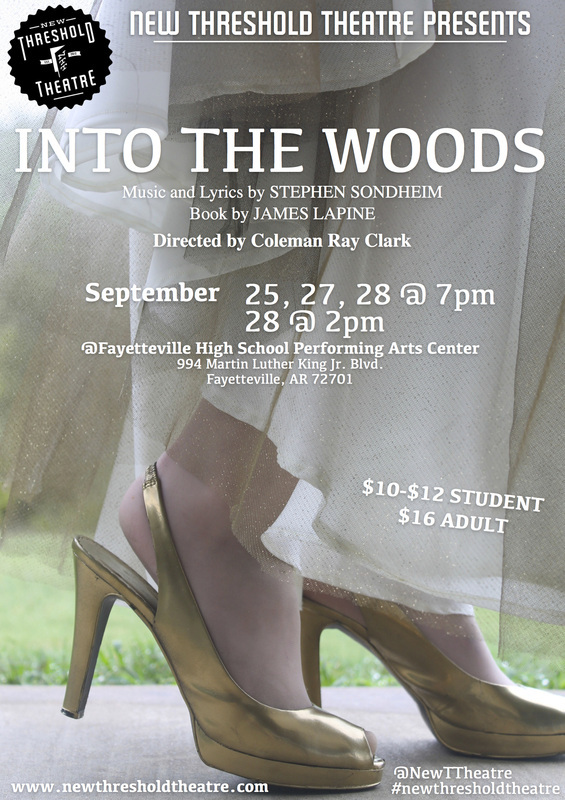 She is sixteen years old and is an upcoming junior at Fayetteville High School. LUCY ROSSI (The Witch) previous NTT appearance was 13: the musical! Community credits include Alice in wonderland, The Hobbit, Annie, Willy Wonka, The Jungle Book, Cinderella, Beauty and the Beast, Little Mermaid, Bridge to Terabithia, Hairspray(Arts Live Theatre); Annie, Best Christmas Pageant Ever (Arts center of the Ozarks); and Seussical (Trike Theatre). Film credits include Tandem( FHS Film). Lucy is fifteen years old and is an upcoming sophomore at Fayetteville High School. MARY LARKIN FURLOW (Stepmother) makes her New Threshold Theatre debut. Community credits include Hairspray, Alice in Wonderland, The Little Mermaid, Beauty and the Beast, Willy Wonka and Annie (Arts Live Theatre). She is fifteen years old an a sophomore at Fayetteville High School. 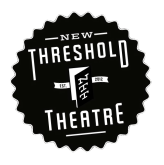 SARAH HIERHOLZER ( Jack' s Mother) has appeared at New Threshold Theatre in the NTT Holiday Experiment and on New Threshold Theatre Live. Community credits include Lilliput in Christmas Cariol High School (Artslive Theatre), Cheshire Cat #3 in Alice in a Wonderland Jr. (Artslive Theatre), Mrs. Mann in Oliver Twist (Artslive Theatre), Nurse Mossy in Teenagers from Outer Space (Artslive Theatre), Miss Nelson/Miss Swamp in Miss Nelson is Missing (Artslive Theatre), Town Crier in Cinderella Jr. (Artslive Theatre), Elephant in Jungle Book Jr. ( Artslive Theatre), June in Ascension Day (Artslive Theatre), Prudy Pingleton in Hairspray Jr. (Artslive Theatre), Lighting in Through These Eyes (Fayetteville High School). She is seventeen years old and a senior at Fayetteville High School. 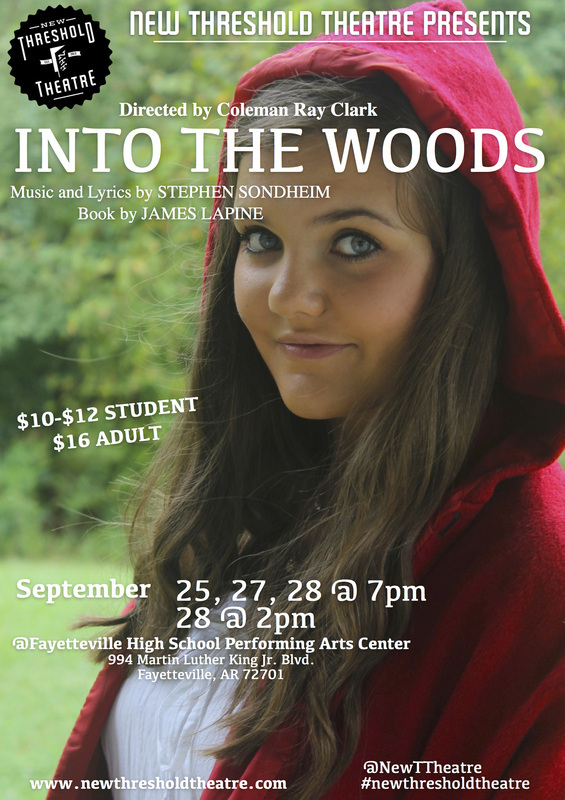 ASHLYN GRACE BROTHERS (Rapunzel) is excited to return to New Threshold Theatre. This past winter she appeared in The NTT Holiday Experiment and she is a writer for NTT Live (New Threshold Theatre). She also performed in The Second City Improv Show (The Second City- Hollywood), the Musical Showcase (Broadway Artists Alliance- New York City), and Bye, Bye Birdie (Camp Broadway- New York City). Community credits include The Sound of Music, Hansel and Gretel, Alice in Wonderland, The Best Christmas Pageant Ever (Arts Center of the Ozarks); A Christmas Carol (University of Arkansas), and Merchant of Venice (Shakespeare Festival). Television and new media credits include sketch comedy performer in The Tonight Show with Jay Leno (NBC) and Abby’s Groovy Getaways (DeLaurentiis Productions), and she is also a member of SAG-AFTRA. She is fifteen years old and currently a sophomore at Haas Hall Academy in Fayetteville, Arkansas. EJ CHRONISTER (Jack). EJ was Evan in 13: The Musical with NTT. He played TweedleDee in Alice and Wonderland Jr.; Cogsworth in Beauty and the Beast Jr; and Mike TV in Willy Wonka Jr. with Stage One Entertainment. He is sixteen, homeschooled, and will be going into eleventh grade this year. He is the drummer for the band Breaking Silence. GARRETT WIEGEL (Cinderella's Prince and the Big Bad Wolf) has appeared in Completely Hollywood, NTT Holiday Experiment, and the 24-hour Play Fest (New Threshold Theatre). Community credits include Go Dog Go (Arts Center of the Ozarks), Bridge to Teribithia (Arts Live Theatre), Shrek The Musical, Miss Nelson is Missing, and Har-Ber Variety Show (Har-Ber High School), and Hamlet (T2 Summer Camp). 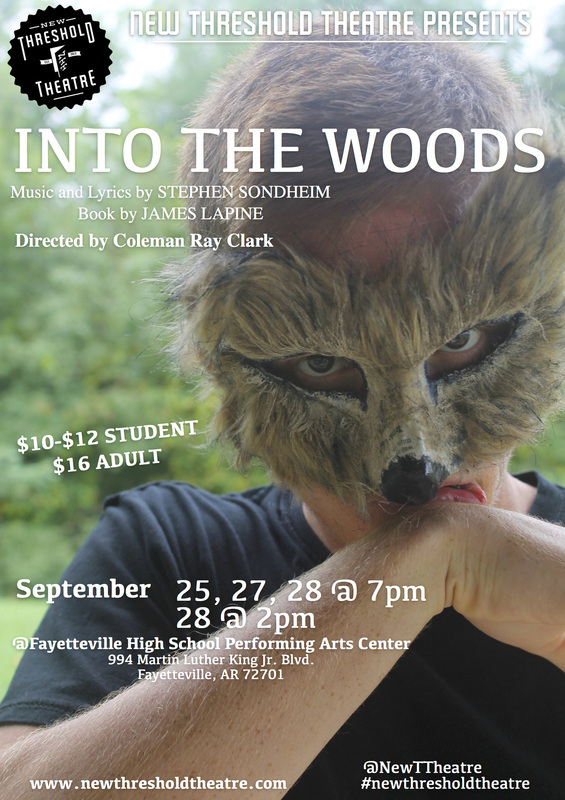 Televison credits include New Threshold Theatre Live (Fayettville Public Access). He is seventeen years old and is an upcoming senior at Har-Ber High School. LANDON CALHOUN (Baker/Vocal Director) returns to the NTT stage after appearing in 13: The Musical as Archie, Charade as Peter Joshua, and the director of The NTT Holiday Experiment. Other community credits include Schwartz in A Christmas Story, Ensemble in The Music Man, Colin Craven in The Secret Garden, Ensemble in Joseph and the Amazing Technicolor Dreamcoat, Kurt von Trapp in The Sound of Music, The Artful Dodger in Oliver! (Rogers Little Theater); Charlie Bucket in Willly Wonka Jr, Tweedle Dum in Alice in Wonderland, Jr. (Stage One Entertainment); Weird Sisters, Gaston in Beauty and the Beast, Grimsby in The Little Mermaid, Ascension Day, Jessie in Bridge to Terabithia, Tweedle Dum in Alice in Wonderland Jr. (Arts Live Theatre); Laertes in Hamlet, Oliver de Boys in As You Like It (Theatre Squared's Summer Drama Academy). This season is Landon's first official season as an Artistic Director with New Threshold. He is 16 years old and a junior at Fayetteville High School. MACEY CHARBONEAU (Prop Design) Macey returns to New Threshold working behind the scences. She worked backstage in 13 The Musical (New Threshhold Theatre) and has also worked backstage with Almost Maine (Fayetteville High School). She has been featured in Arts Live Theatre's productions of Alice in Wonderland and Hairspray Jr. She is a current Junior at Fayetteville High School. ABIGAYLE LUTTRELL (Granny/Florinda) is making her NTT debut. In New York, she has appeared in the Macy’s Thanksgiving Day Parade and the NY Pops Spring Gala at Carnegie Hall (Camp Broadway). Community credits include Hairspray, The Little Mermaid, Peggy the Pint-Sized Pirate, Honk!, The Jungle Book, Willy Wonka and the Chocolate Factory, The Wizard of Oz, Alice in Wonderland (Arts Live Theatre); The Sound of Music, Cinderella, Go, Dog, Go!, If You Give A Mouse a Cookie, Miss Electricity, Annie, The Best Christmas Pageant Ever, American Girl Fashion Show (Arts Center of the Ozarks); Captain Bree and her Lady Pirates, and Santa on Trial (Hellstern Middle School). She is fifteen years old and is a sophomore at Har-Ber High School in Springdale. THOMAS BAKER (Steward) is thrilled to return for his second season with New Threshold Theatre! Previous NTT credits include Eddie in 13: The Musical, lead actor in The Holiday Experiment and featured actor in New Threshold Theatre Live! Regional credits include a featured ensemble role in Godspell (SMTI, Arkansas Repertory Theatre). Local credits include The Little Mermaid, Alice In Wonderland and Hairspray (Arts Live Theatre). He is fourteen years old and is a freshman at Woodland Junior High School.